3.4GHz(9cm)was the band on which I made my first microwave transmissions back in the very early 1970s. In those days the gear was based around a 60 milliwatt output klystron, the 726A/B. How times have changed! I have been wanting to get back on the 9cm band for many years but it took a visit to Germany to set me off on this latest construction project, a 15 watt portable transverter for 3.4GHz narrowband. The homemade aluminium case is designed to withstand rough treatment when used under portable conditions . Note the finned heatsink on the right hand side. This is for the 15 watt power amplifier. In September 2002, I visited the VHF/UHF Convention at Weinheim in Germany. 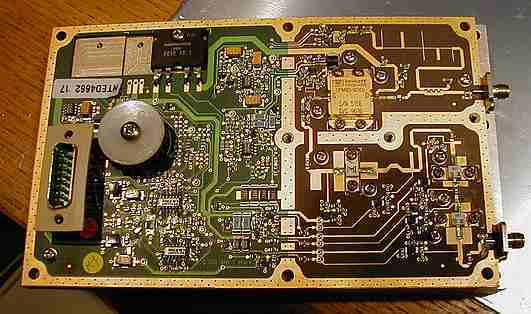 There I purchased a DB6NT 3.4GHz transverter kitset, direct from DB6NT himself as he had a stand at the event. It wasn't until I got home that I realised the construction manual was in German and I don't know more than half a dozen words of that language! However, all was not lost because I was well-acquainted with Michael Kuhne's (DB6NT) excellent kits, having already built up 10GHz and 5.7GHz DB6NT tranverters. 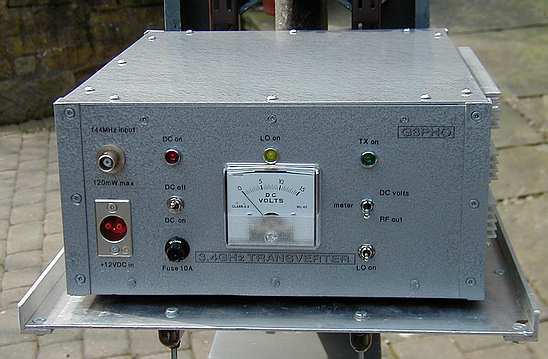 The following pages show you how I put the 9cm kit together and integrated it into a potent 15 watt output transverter. A more detailed PDF document version of this article (with circuit diagrams, etc) is available for download if you would like to have a copy. Just click here to start the download. You will need Acrobat Reader to open the document. The document is 1.3MB in size and will take approximately 7 minutes to download with a 56K modem. The basic module is available in kit form from DB6NT for around £200 sterling. You can also buy a ready made version but you'll get more satisfaction if you build your own! The photo above shows the circuit board side with all components finally soldered into place. Just before I went to Weinheim I had also collected a surplus solid state 9cm PA from Mark, GM4ISM. He has been supplying these for some time now, along with receiver sections and even antennas if anyone wants them. The PAs come from the now defunct Ionica telephone system which used the 3.4GHz band to relay telephone data from base to subscribers. These excellent amplifiers require no modification at all if one is happy with around 14 to 15 watts output. Mark and others have achieved around 22 watts out but have made some modifications, particularly to the biassing arrangements. I am quite happy to get 15 watts as the gear is used from portable locations, where battery current consumption is an important factor. The amplifier requires only around 1 milliwatt of drive at 3.4GHz for 15 watts output! The input is applied to the sma connector lower right while the output appears at the upper right connector, also sma. The 15 pin D connector on the left is multi-purpose, receiving all power requirements and outputting useful readings such as PA temperature and a power output indication. The DC supply requirements are: +10V (at approx 4 amps), +12V, -12V and +5V.